Where Should Blood Lactate Samples be Taken From in Swimmers? 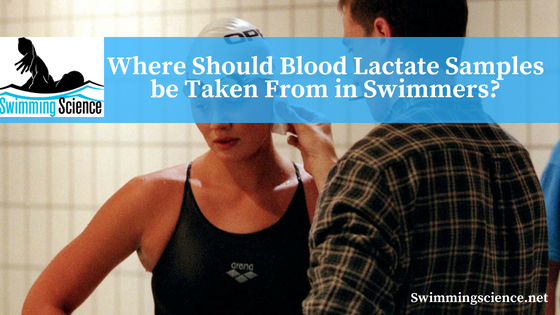 Blog Where Should Blood Lactate Samples be Taken From in Swimmers? Blood lactate testing is typically performed at swimmers at National competitions and sometimes during practice. Most often at meets, blood is drawn from the ear, yet blood lactate samples are commonly taken from the fingertip in practice. It is believed that blood circulating in the body contains the same blood lactate, but this has yet to be determined. However, these sites are used interchangeably in a meet to determine how to warm down volumes and practice to determine effort levels. The aim of this study was to determine accuracy between the fingertip and earlobe for measures of blood lactate to examine whether these sample sites may be used interchangeably. Twenty healthy men performed an incremental cycling test. Capillary blood was taken simultaneously at the ear and fingertip to determine blood lactate concentration. There was no significant difference between sample sites; however, there was a strong positive relationship. However, the fingertip typically showed a bias toward higher blood lactate concentrations. The results also suggest blood lactate at both sites can be used to determine heart rate and power output. The high level of agreement and negligible difference in blood lactate sample site suggest that these sample sites could be used interchangeably. There is no reason to believe there would be a difference in population, therefore the results are suggested for swimmers of various training ability. Overall, there is a slight difference in blood lactate between the fingertip and earlobe, but this difference should not alter training intensities.